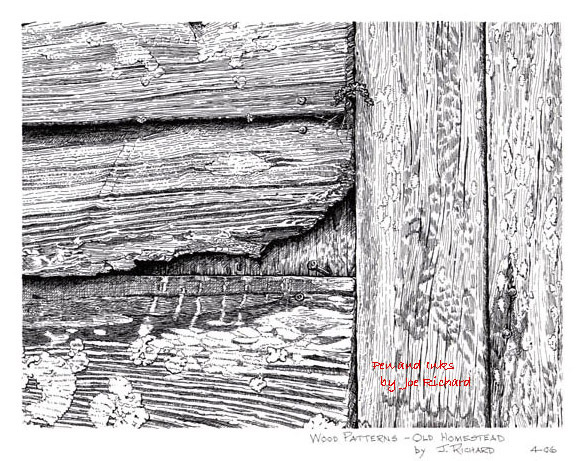 "Wood Patterns (of Old Homestead Door Frame)"
"Wood Patterns" is a study in pen and ink that was taken on to illustrate the attention to fine detail that this artist can achieve using various pen nubs while executing a rendering. This particular drawing illustrates the finer details of another piece in this portfolio, entitled the "Old Homestead". A small section of cypress wood on the door frame is the subject in this illustration. "Wood Patterns" utilized technique in line art and stippling to create a dimensional effect to the work. The work depicted was done from a series of photographs of an old family homestead located in southwestern Louisiana. This study in pen and ink techniques was completed in April 2006. The work took approximately 20 hours to complete and measures about 8 x 10 inches on an 11 x 14 background. 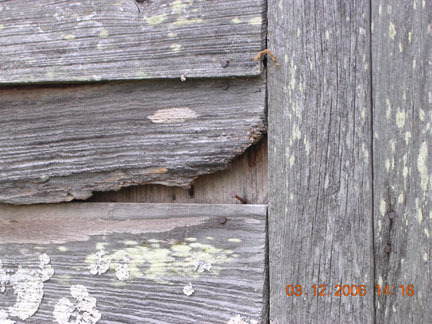 The photo used in completion of "Wood Patterns" artwork. The photo was taken by artist and is Copyrighted by him.